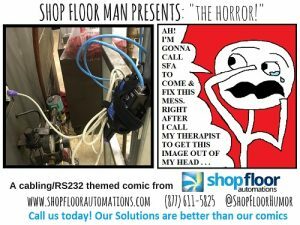 Shop Floor Man, our manufacturing comic book hero, has been on some new adventures since we last posted the Halloween strip here on our blog. Let’s see what other machinist hijinks he has gotten up to, since we last left off with some new Shop Floor Man comics. Since the holidays just passed us, it was natural that this time of year entered into Shop Floor Man’s realm. In this strip, we learned the real reason why machine monitoring was implemented into our cartoon protagonist’s shop. Santa always knows when someone is doing something naughty, even on a manufacturing shop floor! Then today, we saw that Shop Floor Man looks to have made a New Years Resolution by replacing complicated, antiquated job scheduling techniques with graphical job scheduling. This is sure to save him lots of time and aggravation. If there are any manufacturing or machinist themed adventures you would like to see Shop Floor Man explore in future comics, we would love to hear from you! Contact us here, or via one of our social media channels. We are also available at Toll Free at (877) 611-5825. Remember – our solutions are better than our comics.